Scooper - Technology News: Echo chambers: fact or fiction? Echo chambers: fact or fiction? The recent emergence and success of political movements that appear to be immune to any factual evidence that contradicts their claims – from climate change denialists through Brexiteers to the ‘alt-right’, neo-fascist groups supporting Donald Trump – has reinvigorated claims that social media spaces constitute so-called ‘ filter bubbles ’ or ‘ echo chambers ’. On social media, the theory goes, the adherents of these ideologies gather to furiously agree with each other, to the exclusion of all non-believers. And there’s a new name for what circulates in these spaces – ‘post-factual’ information – although in reality what we are talking about is anything but new, and used to be known simply as propaganda. But there’s a problem with the echo chamber argument: it is itself not particularly well supported by the available facts. You might even call it ‘post-factual’ in its own right. 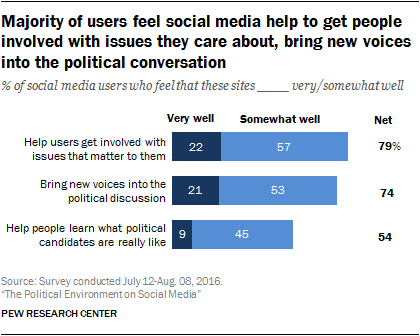 Shortly before the U.S. election, the venerable Pew Center released the results of a representative national survey of U.S. adults that explored the political environment on social media. The results of the study (originally conducted in July and August 2016) are, at first glance, unsurprising: approaching the end of a long and spiteful campaign, American social media users are resigned and frustrated with the tone and content of election discussions. Who could blame them? One can only imagine how much more stressed they must feel now, as political discourse in the United States descends to previously unimaginable lows including overt public racism and actual Nazi chants . But something here doesn’t add up. If the echo chamber argument holds true, users should rarely encounter political content they disagree with – and should therefore have little reason to feel so frustrated. 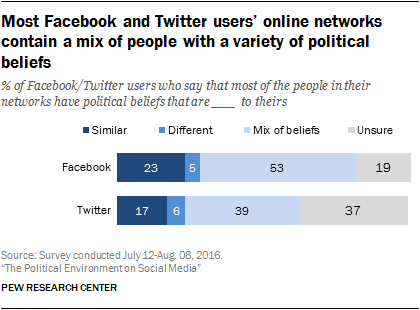 Instead, however, Pew reports, 50% of social media users have been surprised by one of their social media connections’ political views, and only 23% of users on Facebook and 17% on Twitter now say with confidence that most of their contacts’ views are similar to theirs. The results of such politically heterogeneous connections are similarly remarkable: yes, some 39% of social media users say they’ve changed their settings to filter out political posts or block certain users in their network; this could be seen as an attempt to build the echo chamber, of course, but in itself is also a clear sign that those filtering mechanisms are as yet far from effective. But conversely, some 20% of users also state that they’ve changed their minds about a political or social issue because of their interactions on social media. If echo chambers genuinely do exist, then, they are likely to do so only on the fringes of the political spectrum, and only when we view very specific political social media spaces – such as individual Twitter hashtags and Facebook groups – in isolation. But most of us tend to use social media for a much broader range of purposes, where we also encounter a much more diverse collection of users. Here, the political news and information that circulates is considerably more variable: as the Reuters Institute’s 2016 Digital News Report has pointed out, fully 52% of Internet users across the 26 nations it surveyed are now proactively or reactively sharing news as part of their routine social media activities – and what we share is as varied as the personal interests and identities of this vast userbase. What we share may be factual information or political propaganda, truth or falsehood – but don’t doubt for a second that in aggregate this material will reach a very broad audience that can make its own decisions on what it does or does not believe. Elegant though it may seem, the echo chamber concept simply doesn’t seem to be borne out by the facts. There’s a term for that.